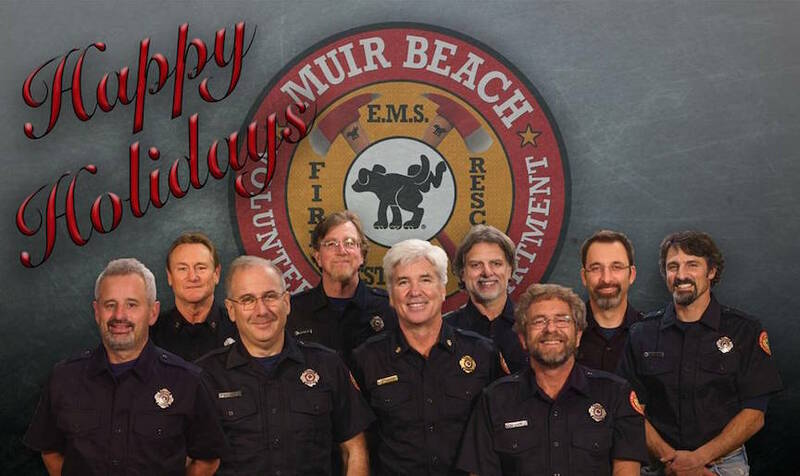 The members of Muir Beach VFD in 2013, photo courtesy MuirBeach VFD. Prior to 1970, fire protection in Muir Beach was provided by the Bello Beach Fire Department, a private organization. During that time, two cottages burned to the ground in a single month. The reason? The volunteer department refused to respond to the blazes because the owners of the burning structures were not members of the Bello Beach group. One outraged Muir Beach resident snatched the keys to the fire engine and raced to the scene of the second fire, but flames had already consumed the structure. 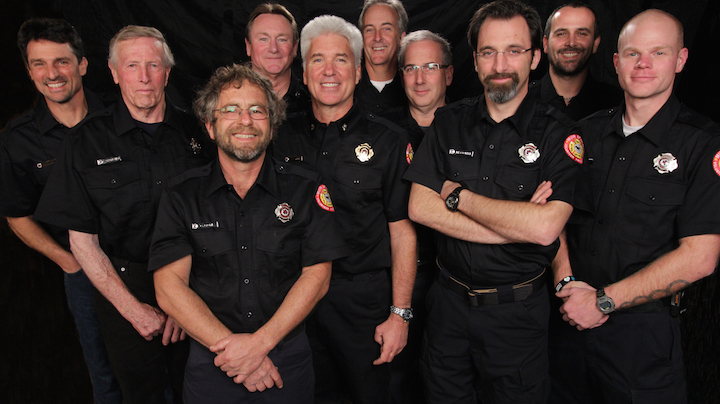 The Muir Beach Volunteer Fire Department (MBVFD) of today grew out of the ashes of those two unfortunate fires. After the incident, the Muir Beach community rallied. Angry and concerned about potential loss of life and further property damage, the residents voted to form their own volunteer fire department. John Sward, then 27, was elected as the first fire chief. The new department started out slowly with just three volunteers. They began training at the Tamalpais Valley FPD fire station. As the number of volunteers slowly grew, Chief Sward hired Marin County firefighters to come to Muir Beach to teach the new recruits. The equipment was often hand-me-down or rag tag. The first "turnout gear" was an assortment of coats, pants, helmets and gloves acquired from the fire department at the decommissioned Hamilton Air Field. The truck was a 1951 International, bought from the Bello Beach group. "You felt like your rear end was banging on the road," Chief Sward said about the suspension. The first MBVFD firehouse was located at what is now the front parking lot of the Pelican Inn. Calling it a "firehouse" is probably an exaggeration. It was just a long garage at the site of the community's old water well. Next, the station was moved across Hwy. 1 to the old Golden Gate Dairy barn. Built at the turn of the century, the building required extensive renovation. In 1972, community members pitched in to get the work done. In 1974, National Park Service began stewardship of the site and, in 2007, the building was designated a historic structure. Early on, Chief Sward realized that he needed to raise funds to support the equipment and training needs of the department. He came up with the idea of an annual Fireman’s BBQ to raise money. This yearly Memorial Day weekend event still exists today and has become a rich tradition in the community. Residents of all ages come out each year to plan, prepare and run the annual event, with all proceeds going to benefit the MBVFD. Fundraising continues to be an important component of running the MBVFD. 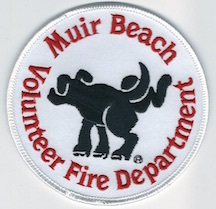 In 1994, the Muir Beach Volunteer Firemen's Association (MBVFA) was founded, consisting entirely of volunteers from the community. The MBVFA’s primary mission is to acquire funds for the training, equipment and operation of the MBVFD. These funds come from the annual Memorial Day BBQ, grants, a special fire tax collected from the residents of Muir Beach and generous donations from neighboring fire districts and members of the community. The department's responsibilities have expanded dramatically since its inception. In the early years, the volunteers only trained for structural fires. Now the MBVFD volunteers are also trained to respond to wildland fires, medical emergencies, vehicle accidents, biking and hiking accidents, floods, mudslides, earthquakes, search and rescue and managing medical helicopter landing zones. The response areas include Muir Beach, Green Gulch Farm, Slide Ranch, Muir Woods National Monument, Mt. Tamalpais State Park and all roads in the area, including Highway One. From its inception in 1971, Chief John Sward was at the helm of the MBVFD. During this 41 year span, he only took two breaks from the position of Fire Chief, when Bill Farkas and Michael Moore stepped in for periods of time. 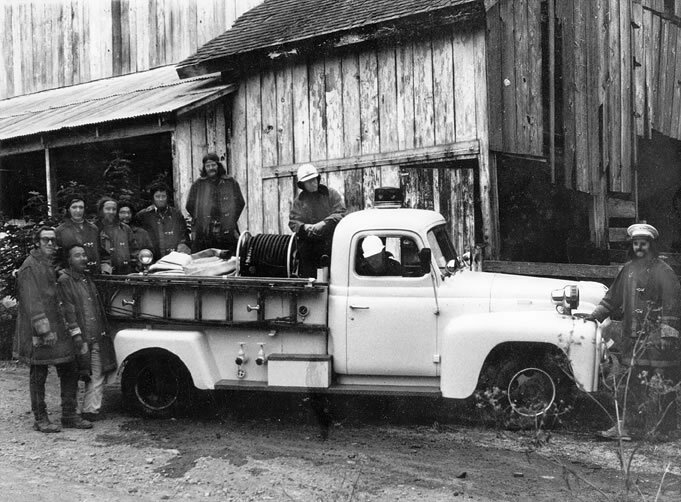 Born out of the ashes of fiery destruction, The Muir Beach Volunteer Fire Department began as a reaction to a community divided. Today, it stands proudly as a cornerstone of Muir Beach, representing the entire community and serving all of the surrounding areas. On May 27, 2012 at the annual Fireman’s BBQ, John Sward handed over the reigns of the MBVFD to Chief Steve Wynn. Living in Muir Beach with his wife, Joanie and young son, Ryan, Steve was excited about the opportunity to lead MBVFD into the future. In 2011, with generous grants from Fireman’s Fund Insurance and FEMA, MBVFD acquired Squad 660, a new 4-wheel drive Ford 550 brush truck. Then in 2012, we made an offer to purchase a used Type III engine from Skywalker Ranch. Skywalker Properties Ltd. instead made a decision to donate the engine to us. It's a 1989 Pierce 4WD Type III in excellent shape, and a photo is posted below. It was presented as a surprise to our community that summer. We in turn decided to donate our old 2WD Type III for use in Plumas County to the all-volunteer Plumas Eureka FD. This engine had originally served in the Marin County Fire Department for many years, and was donated for our use by the County. It served us well for many years, and will continue to serve in the fire service for many years. Plumas Eureka, in turn, donated an even older Type II they had received from San Bernardino County to the all-volunteer Downieville FD in Sierra County. Chief Wynn envisions continued community involvement, offering residents instruction on everything from CPR and AED training to fire extinguisher use and water safety. He is also active in assisting community efforts for emergency preparedness. Most exciting of all is the news that, with generous support from the Muir Beach community, a new firehouse is on its way. 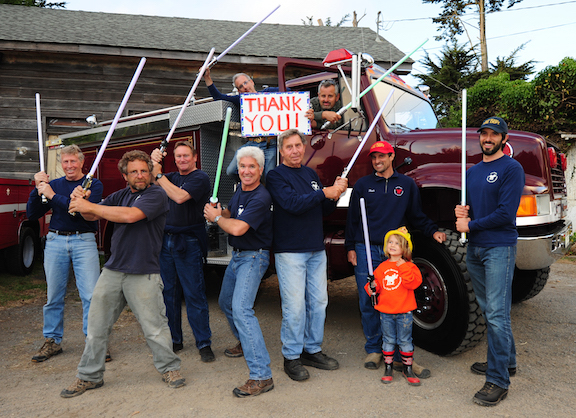 With construction slated to begin in 2015 or 2016, it will be the first permanent home of the Muir Beach Volunteer Fire Dept. Chief John Sward before his retirement. A video interview will be posted soon. We sent this group photo to Skywalker Properties Ltd. after the donation of their Type III engine in 2012. 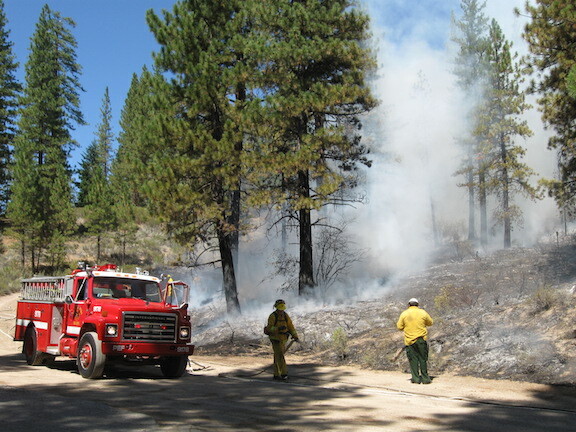 The donated former MCFD and Muir Beach Type III in action in Plumas County at a forest fire. Photo courtesy of Maureen Forster.